OMG! China is becoming just like America. LOL. Beijing police on Tuesday detained another outspoken online whistle-blower, in an escalating campaign against the vibrant online community of government critics and influential liberal opinion leaders. Huazong shot to fame in 2011 after he started blogging about luxury watches worn by government officials. Drawing on his knowledge of luxury goods, he found published pictures of many government officials online and identified the luxury watches on their wrists, down to details such as brand, model, year and market value. Within a few years, Huazong had written about almost 100 officials and their expensive timepieces. Since the value of the watches far exceeded the legal income of those officials, many of them have come under investigation, been sacked or received prison terms for corruption. Ironically, Yang Dacai, one of the officials that Huazong exposed, was sentenced less than two weeks ago to 14 years in prison after he was convicted of taking bribes and “owning a large amount of assets of unknown origin”. It is unclear if Huazong’s detention is related to his whistle-blowing activities against officials with a soft spot for expensive watches. Huazong has also used his knowledge of luxury goods and industry in recent years to expose what he calls “frauds”, and published a series of influential satirical essays about luxury lifestyles. Ouyang Kun, a shadowy businessman who claims to be the chief executive of several international luxury organisations, was briefly investigated by the authorities after Huazong accused him of faking his professional credentials, college degrees and affiliations with international organisations. He has threatened to take Huazong to court. He declined to say if his rival’s detention had anything to do with their previous disputes. 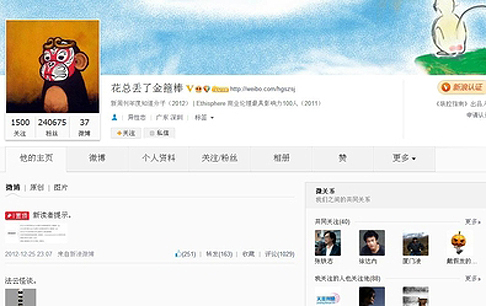 A screenshot of Huazong's Weibo page.